As my freelance business has grown, I've really been trying to keep up with the growth and create systems for my workflow. One thing that makes this so much easier is FreshBooks, a cloud accounting, invoicing and expense-tracking system that I really love. I'm an affiliate for them now, because I use them so much, so if you click through any of my FreshBooks links and decide to sign up, I get a commission at no charge to you! I used to make a new Word document invoice every time for every client, and email it. FreshBooks lets me send out recurring invoices, lets me email it as a PDF or Word, and they will even print it out and mail it for me (they include a return envelope)! It's awesome! My invoices have my logo and are easily searchable by client, and I can track paid and unpaid invoices. Clients can even pay me by PayPal or credit card, an option I never had before. I also love the automatic expense tracking. Once you import the bank info (totally secure) for your business checking and credit card accounts, they automatically import your expenses and categorize them for you. WHAT HOW AMAZING IS THAT. There is also a time-tracking feature, which is awesome for my bigger projects (like book writing). My favorite feature here is the real-time TIMER button, where you start and stop the timer and it automatically adds the time to your invoice. Woah-hey. The mobile app lets me snap a picture of a receipt and add it to expenses so I can ditch the receipts crumbled up at the bottom of my purse for "sorting later" (you did that too, right?). And P&L statements? Literally click a button. I just love that I can access this anywhere, too, since being mobile is part of my freelance business. 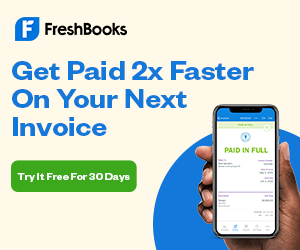 FreshBooks is priced at $12.95 for up to 5 clients, then it goes up incrementally, but tops out at $39.95 a month for unlimited clients (click here for more pricing details & to start your free 30-day trial: Pricing). Trust me, this is nothing compared to the time and frustration this saves, which means I can add more billable time and projects to my week instead of spending it on invoicing, adding expenses, etc. I truly love FreshBooks and if you run your own thriving small business, encourage you to check it out!